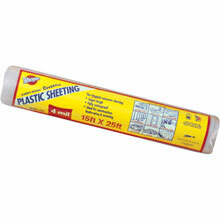 Clear Polyethylene Plastic Sheeting Tarp - 6' x 50' - 4 Mil. Clear Polyethylene Plastic Sheeting Tarp - 6' x 100' - 4 Mil. Clear Polyethylene Plastic Sheeting Tarp - 6' x 100' - 6 Mil. 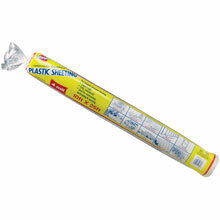 Clear Polyethylene Plastic Sheeting Tarp - 8' x 50' - 4 Mil. Clear Polyethylene Plastic Sheeting Tarp - 8' x 100' - 4 Mil. Clear Polyethylene Plastic Sheeting Tarp - 8' x 100' - 6 Mil. Clear Polyethylene Plastic Sheeting Tarp - 8.33' x 200' - 1.5 Mil. Clear Polyethylene Plastic Sheeting Tarp - 8.33' x 200' - 2 Mil. Clear Polyethylene Plastic Sheeting Tarp - 8.33' x 100' - 4 Mil. Professional Painter's Plastic Sheeting Tarp - 9' x 400' - .35 Mil. 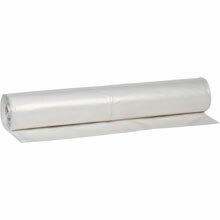 Clear Coverall Plastic Sheeting Tarp - 10' x 25' - 4 Mil. Clear Polyethylene Plastic Sheeting Tarp - 10' x 50' - 4 Mil. Clear Polyethylene Plastic Sheeting Tarp - 10' x 100' - 4 Mil. Clear Polyethylene Plastic Sheeting Tarp - 10' x 100' - 6 Mil. Painters Plastic Sheeting Tarp - 12' x 400' - .35 Mil. Clear Polyethylene Plastic Sheeting Tarp - 12' x 50' - 4 Mil. Clear Polyethylene Plastic Sheeting Tarp - 12' x 100' - 4 Mil. Clear Polyethylene Plastic Sheeting Tarp - 12' x 100' - 6 Mil. Clear Polyethylene Plastic Sheeting Tarp - 14' x 100' - 4 Mil. Clear Polyethylene Plastic Sheeting Tarp - 16' x 50' - 4 Mil. Clear Polyethylene Plastic Sheeting Tarp - 16' x 100' - 4 Mil. Clear Polyethylene Plastic Sheeting Tarp - 16' x 100' - 6 Mil. Clear Polyethylene Plastic Sheeting Tarp - 20' x 50' - 4 Mil. Clear Polyethylene Plastic Sheeting Tarp - 20' x 100' - 4 Mil. Clear Polyethylene Plastic Sheeting Tarp - 20' x 100' - 6 Mil. Clear Polyethylene Plastic Sheeting Tarp - 24' x 100' - 4 Mil. Clear Polyethylene Plastic Sheeting Tarp - 24' x 100' - 6 Mil. Clear Polyethylene Plastic Sheeting Tarp - 28' x 100' - 6 Mil. Clear Plastic sheeting, tarps, drop cloths & visqueen offering the lowest cost all-purpose protection against water vapor and foreign matter. Full compliance with both VA and FHA specifications and meets the EPA RPP Lead Law Requirements. » View Size/Color Reference Chart.